A wine tour is a truly savory experience for wine connoisseurs in the Greater Raleigh area, home to two famous wineries with onsite vineyards. One of these vineyards starts in Wake County and the other here in Raleigh. The most amazing wine practices that have been occurring for thousands of years can be discovered and enjoyed during these tours. The popularity of winery tours has grown and been much appreciated by the aficionados in the North Carolina area. Raleigh Limousine and Party Bus Service will usher guests to their beautiful wine tasting destination in elegance and style, and know the most breathtaking routes to take so that guests can enjoy every moment of their wine tour. A number of libations and amenities are available in each limousine or vehicle we have to offer. Snack, beverage and cocktail bars are options that our guests enjoy on the way to their desired wineries. 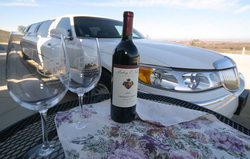 Unique wines purchased from the tour can also be enjoyed inside the limousine, and your chauffeur will be happy to assist in finding complimentary pairings from any nearby stores. Limousines or party buses can also be specifically decorated for your special occasion, and every detail requested by our clients is noted and kept by their personal chauffeur. Music playlists can also be formed upon request to set the mood of the wine tour for you and your guests. Atmospheric changes in the vehicle are easy to be made according to the preferences of our clients. Our priority is ensuring that our guests enjoy the best winery experience possible, and each chauffeur is trained to deliver that promise to our customers. Every vehicle that Raleigh Limousine and Party Bus Service carries is of the utmost quality, and is licensed and ensured. Great care is taken in every detail of the ride, as well as taking down any specifications of the personal amenities chosen for your wine tour. Itineraries are formed with our customers so that every part of their day goes as smoothly as possible while they enjoy their day out in the beautiful wine country that North Carolina has to offer. Any scheduled commitments are adhered to, and trip routes are followed from vehicle arrival to guest return. Our company has a variety of beautiful vehicles that can usher our guests and their company on their wine tour. Not only are our vehicles affordable, but we are able to serve a variety of guest numbers in one vehicle from 2 to 56 people. Vehicle preferences are easy to be accommodated on account of the large fleet Raleigh Limousine and Party Bus Rentals has to offer its clients. Our bachelor party transportation options also give a variety of interior choices, including leather and other beautiful finishes. After the wine tour is finished, chauffeurs can also take wine tour guests to a restaurant or new venue of choice to finish the evening. 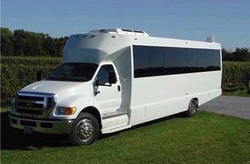 Let Raleigh Limousine and Party Bus Services impress you and your guests with a wine tour to remember for years to come! go all out on your next wine tour & book your luxury limo or party bus service!